l love to garden. No veggies, just showy flowers. In all seasons I have something blooming. The beauty of flowers can take my breath away, make me feel like a better person. This passion dates back to my early childhood in the 1940s in New Orleans with my father as my inspiration. He maintained flower beds in virtually every available spot of soil on our small urban homestead. I remember how even at the tender age of five, I used to follow him as he made his rounds weeding and watering his living bouquets. 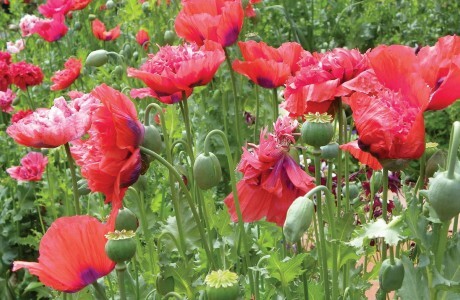 My favorites were what we simply termed “poppies.” These plants grew to be nearly four feet tall—the tallest in the garden—and produced a number of saucer-size flowers. They were rosy-colored, with crepe-paper-like petals, and (the popular image of the simple red Veterans Day poppy notwithstanding) resembled carnations, dahlias, giant mums, or the common field thistle. The dried seedpods—rather exotic in looks—concealed an enormous number of tiny black seeds, which were saved for the next year’s planting and for sharing with garden-loving friends. Some of the empty pods were placed in a kitchentable vase for much of the remaining year. But after I relocated to Baton Rouge at the age of twenty-one, I no longer encountered poppies, and the plants slowly slipped from my memory. substances controlled by the U.S. Drug Enforcement Administration. In practice, though, the plant can be cultivated in small numbers by American homeowners and in public gardens for ornamental and educational purposes without reprisal from drug enforcement officials. Seeds are marketed on the Internet, and at my local garden center you’ll even find young plants. Around mid-February new leaves emerge on my opium poppies, and by early March the plants grow silvery-green. 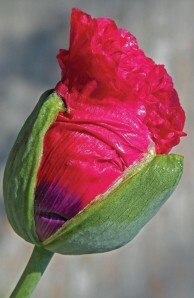 In a short time, an egg-shaped bud appears on terminal, goose-necked stems. The stems gradually straighten as the petals unfurl. And in contrast to other species of poppies grown in North America, these flowers are large (as much as six inches across) and are represented by three different forms (only one type per plant, however), with gradations in between. 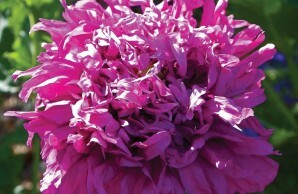 Singles are typically “poppy-like,” that is, four delicate, crinkly petals that create a cup accented by four dark basal markings—a kind of cross configuration—centered on a single green pistil (female) and multiple yellow stamens (male); powder-puff doubles have four petals augmented by dozens of smaller petals hiding much of the throat; and finally, pompom-like triples boast myriad long, narrow, and incised petals that completely conceal all reproductive parts. Recently I grew ambitious and curious. As a retired entomologist still committed to researching butterflies, I wished to learn if the opium poppy played any role in butterfly biology. I secured 126 small plants and installed them as a grouping in a single, raised flower bed. Each morning until about noon, the garden was abuzz with hundreds of honeybees and bumblebees. The single forms were especially attractive to the insects. Doubles and triples were also well visited, even though the insects had to work a bit harder to reach the bloom’s concealed reproductive parts. Within just a few minutes each bee was able to pack onto its legs a full load of pollen. Sadly, individual flowers lasted only several days, not much time for the insects to find and then feed. But the plants continued to put forth new stems and buds for three to four weeks—up until early May. After dropping its petals, each flower head reveals a small roundish capsule that gradually swells into a one-inch pod capped with a crown of nine to twelve short rays, reminiscent of the diadem on the Statue of Liberty in New York Harbor. As the pod dries, a circle of windows opens beneath the crown. 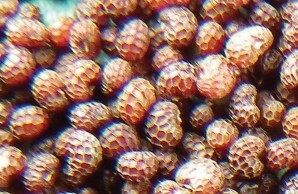 These provide an exit for the numerous seeds within. At season’s end, my 126 plants had collectively produced approximately 2,000 seedpods, each containing between 2,000 and 3,000 tiny seeds. I harvested no less than 4 million seeds, weighing nearly two pounds in total. I saved them for baking muffins and pancakes (the seeds add a slightly nutty flavor, texture, and a lot of protein and fat), for reseeding future flowerbeds, and as gifts to friends who enjoy the culinary arts. In the Middle East, the ancestral home of P. somniferum, the high-caloric seeds are routinely ground into nutritious flour and oil; spent plants are not discarded, but often used as fodder for animals. 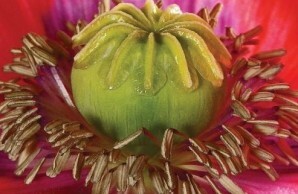 During such brief encounters I have learned a thing or two about the public’s understanding—or misunderstanding—of the word “poppy.” The word is used for a number of similar flowers classified within a single family, the poppy family (Papaveraceae), most of which do not produce opium and range widely in temperate and cold zones of the earth. 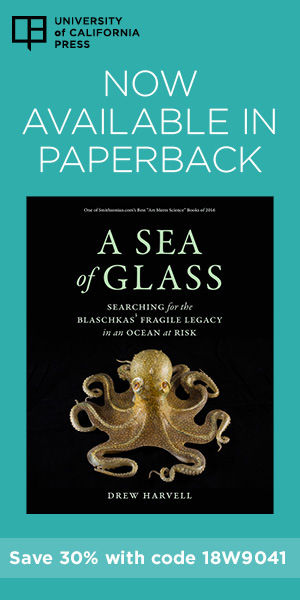 Take North America and Western Europe. Garden fanciers prize several distinctive species other than P. somniferum. 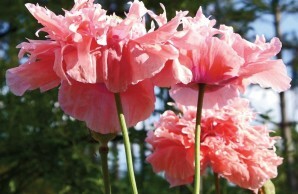 Variants of one species, P. rhoeas, include the Shirley poppy, field poppy, corn poppy, and Flanders poppy. The Flanders poppy, a prolific species native to western Europe, where it is considered an agricultural pest, has become naturalized in much of central Texas. This red-flowering species was the inspiration for the World War I poem “In Flanders Fields”; the poppy lapel pins distributed by U.S. veterans on Memorial Day; the famous large-scale Georgia O’Keefe painting; and the magical field of sedating flowers in The Wizard of Oz. The Iceland poppy is a garden favorite, as is the oriental poppy, a perennial native to the Caucasus Mountains of Eurasia and now one of the most common poppies in the northeastern United States and Canada. Then there is the California poppy (Eschscholzia californica), which holds the honor of being California’s official state flower. It produces small yellow-orange flowers and is responsible for massive springtime displays on dry hillsides in the state. Other popular poppies belong to a more robust group (Argemone spp. ), with large, prickly leaves and stems; they include the thistle poppy, Mexican poppy, and more than a dozen species called prickly poppies. These are native to much of the American Southwest, and their white or yellow flowers with a conspicuous inner circle of bright yellow stamens often appear in dry, disturbed areas, such as roadsides. its largest opium crop on record, despite international efforts to encourage farmers to diversify. My experiment to lure a variety of pollinators to my garden with poppies didn’t entirely succeed. While both butterflies and hummingbirds occasionally flew into the garden, none stopped to feed. This observation satisfied my initial question about poppy pollination: poppies are not butterfly friendly. Although I’m not sure, I suspect the plants produce little or no nectar. However, because bees seemed to favor the poppies, I concluded that the plants were valuable to those insect—particularly important today since honeybees are experiencing a global crisis. 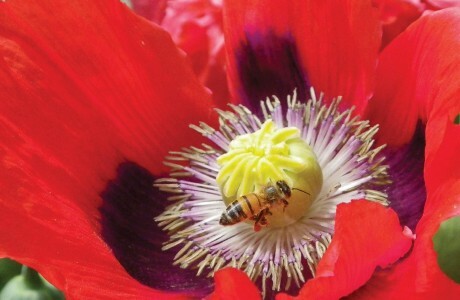 Could poppy evolution have taken the path of utilizing pollen rather than nectar to lure pollinators? I continue planting my favorite poppies and letting each one speak for its own species. My garden is now an outdoor classroom for visitors. As a retired educator and an avid gardener, I hope to revive interest in old-fashioned flower gardens like those that nurtured me as a child. 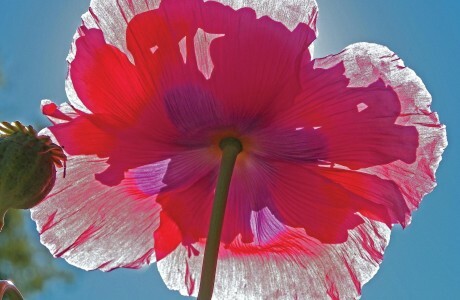 Maybe, too, I can lessen the stigma associated with the word “poppy.” For despite its stained reputation, the opium poppy is still a flower—and one with an extraordinary countenance. 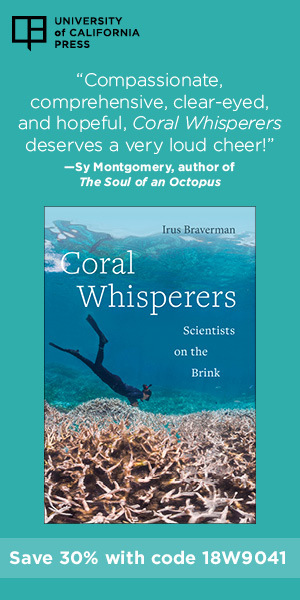 A frequent contributor to Natural History, Gary Noel Ross is Director of Butterfly Festivals for the North American Butterfly Association and a research associate at the McGuire Center for Lepidoptera and Biodiversity at the Florida Museum of Natural History, University of Florida, Gainesville.